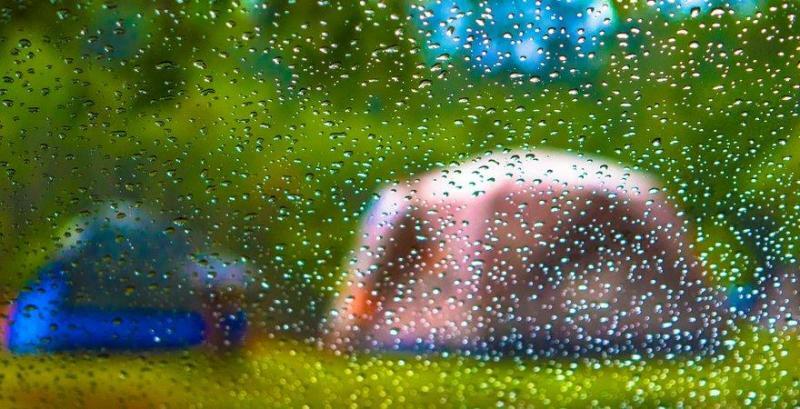 A rainy day might be a reason to feel dull and gloomy through the day, but you don’t have time to be gloomy when you’re camping. So, it is best that you enjoy to your fullest. Make sure you pack the proper rain gear before you head out to camp if the forecast predicts rainy weather. 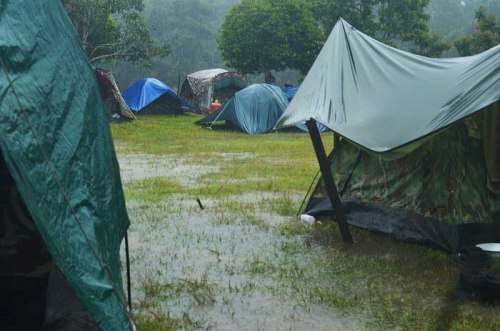 We have listed a few tips that could help you out if you are planning to go camping in a rainy area. If you are properly prepared, camp in the rain can even be an amazing experience for you and your family or friends. Pick a campground with some height and is not close to a stream or lake. The last thing you would want is to wake up in five inches of water during a downpour. If your tent faces the morning sun, it will be less difficult for you to urge yourself out of your tent even in rainy mornings. Furthermore, never pitch your tent under a tree because it takes a lot of time for the raindrops to stop dripping from leaves and tree branches. This will keep your tent damp for a long time, hence it is better that you set your tent up at a spot that does not have trees nearby. Camping in the rain can be pretty difficult and unbearable at times, especially if it’s cold already. To regulate your body temperature and retain body heat when you cool down, you will need a good layering system such as windbreaker or blanket for added warmth under chilly conditions. It is wise to carry a rain coat with wool based or polyester layers of clothing under it. Since it takes a long time for cotton to dry up, don’t carry clothes that are made of cotton. Always make sure to bring extra layers of clothes that you can change into when you have to dry other sets of wet clothes. You can tie a rope between tress to hoist a tarp over your tent. Set the tarp in such a way that it is angled, this will cause the rainwater to run off the sides. You can also hoist tarps over your picnic table to ensure your set up does not get wet because of the rain. Furthermore, you can also place tarp below your tent. However, make sure that no ends are sticking out of the tent as that can cause rainwater to slide inside the tent. Check out the best tarps in this post. Open up any ventilation features in your tent to avoid moisture buildup. You can also open the tent’s door flap as long as there isn't a risk of getting rain water into your tent. The moisture from your breath condenses when you are sitting inside your tent, hence it is important that your tent is properly ventilated. You might need a hot meal or drink to warm up during a bad weather. However, if it’s raining you cannot depend on wood fire. Therefore, it is important that you bring a small wood or portable gas stove that can be easily used. Bring along some waterproof lighter and matches as well. Besides, you can consider getting a cooler to keep your supplies fresh and lasting. Check out here. Plastic bags can be very useful in such situations because they are water resistant. By the time the rain ends, you don’t want your tent to be filled with wet, dirty clothes and sleeping bags. To avoid this, you can bring plastic bags or trash bags to store your sleeping bag, clothes and other important stuff such as lighters and campfire fuel. Smaller sandwich bags can be used to store small important stuff such as your money, documents and phone. Bivy bags can come in quite handy if you are planning to camp in a rainy area. Bivy bags can help you stay warm when the ground gets moist and wet due to rain. 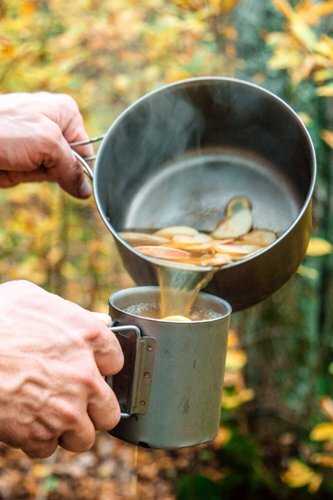 It helps retain heat and it also protects your sleeping bag from the moisture. If you want to be even warmer you can double up on sleeping bags. Or if you want to be more comfortable, get yourself a sleeping pad too. Regardless of whether you're climbing miles of soggy land or just going to the nearby stream to fill your water bottle, make sure you keep an eye where you step because wet ground is slippery. It can be dangerous and slipping and falling over on wet ground can cause serious injuries. It will also leave you muddy and wet, which is another inconvenience. Muddy trails, moist rocks and mossy slopes can all become very dangerous in the rain. It is best that you avoid such paths while walking or hiking. Try to wait and let the path dry out a little before you begin hiking again. Otherwise, get a pair of waterproof camping shoes with excellent traction. Towels and newspapers can be used to mop up rainwater. Hence, make sure you bring along a bunch of old newspapers and small towels. You can also use newspapers to start up a fire if you don’t have anything else at hand. If you want to soak up the moisture out of clothing or shoes, you can simply place newspaper in them. Waiting for the rain to stop can be boring, especially if you don’t have anything else to do. You should bring along things that will keep you engaged while it’s raining outside. This might include a deck of cards, drawing or painting materials, a book, a board game or anything that you like to do. 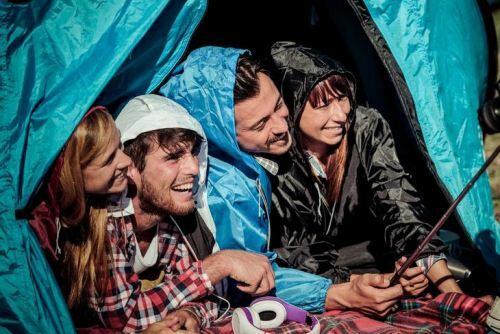 Don’t let the rain make your mood gloomy – you can enjoy camping even when its raining. Keep your children busy as well. You can give them drawing books or coloring books to draw and color in, and you can also keep them engaged by telling them stories. Camp in the rain is definitely going to be the same fun as it is another whole new level of experience and adventure. Be reminded to have well preparation prior your trip.